This guy/woman absolutely crushed me in Words With Friends. I was trying to decide if s/he was a bot. How else do you get 9999 unique words played? Then again, if they're that brilliant at WWF maybe their personal achievement is to use as many unique words as possible. 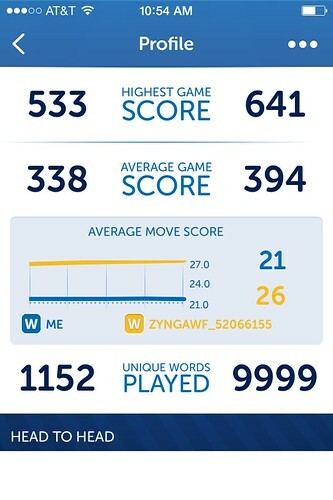 Which makes me wonder how you keep track of the specific 9999+ words you've played. It's either that, or you're a savant. I even went to the trouble of looking the player id up on Google to see if anyone else had been mauled, but they're un-Google-able.